The open competition to create a design concept for Garage Screen Summer Cinema has concluded with a final jury meeting and the selection of the winner from the six shortlisted competitors. In spring 2019, a new summer pavilion will be built in Garage Square in front of the Museum to the design of SYNDICATE architects from Moscow. The competition, which opened on October 17 and came to its conclusion on December 26, 2018, offered up-and-coming Russian architects the opportunity to tackle an ambitious task: they were asked to design a multifunctional temporary summer cinema pavilion that would be accessible to visitors with disabilities and meet the Museum’s standards of environmental responsibility. The competition was organized by Strelka KB. The jury consisted of Dasha Zhukova, founder of Garage Museum of Contemporary Art; Anton Belov, Director of Garage; Varvara Melnikova, CEO of Strelka Institute for Media, Architecture, and Design and founding partner at KB Strelka; Daria Paramonova, head of Strelka Architects; Ekaterina Golovatyuk, co-founder of GRACE studio and the architect behind the Museum’s first summer cinema; and Olga Aleksandrova, partner at BuroMoscow. Founded by a team of young architects with experience in major Russian and international firms, SYNDICATE (Moscow) creates buildings based on the principles of simplicity, availability of materials, and low maintenance. 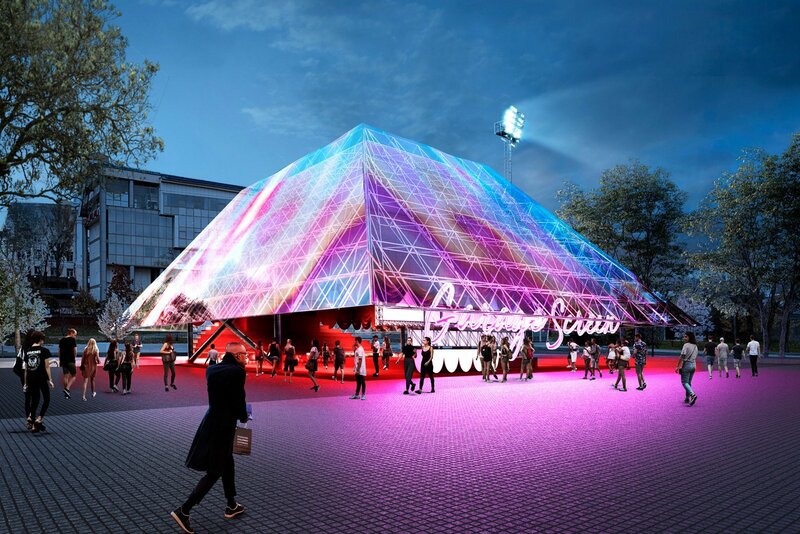 The summer cinema design proposed by SYNDICATE is a truncated pyramid elevated off the ground, which allows for the cinema hall to visually unfold into the park, referencing the architecture of the former Vremena Goda café, which was reconstructed by Rem Koolhaas as a permanent home for Garage. With its bold shape, unusual materials, and functional design, the pavilion will be an architectural statement, and offer the experience of an open-air cinema in any weather, while its holographic facades, Garage Screen neon sign hung at eye level, and red velvet curtains will create a festive mood. The project proposed by Concrete Jungle (Vladivostok) received a special mention from the jury for its interactivity and minimal and clear design, building on the legacy of industrial architecture.